Paris is such an enchanting city that Michele and I try to go there every year. Last year in November, we rented an apartment in the Marais for a week and the weather could not have been better. Michele wanted to try some new (to us) restaurants, and we returned two of my favorite wine stores. I started with a specialty of the Auvergne region, swiss chard torte with salad. It was very good. 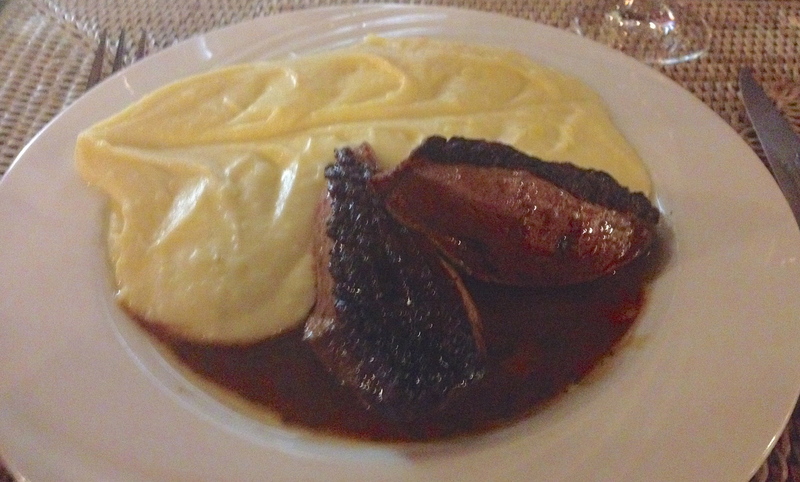 For the main course I had plump, rare cooked magret de canard-duck breast, served with a thick and creamy aligot –a potato puree laced with fresh local cow’s milk cheese. It was whipped at the table and was piled on my plate, hot and delicious. For dessert we had a wonderful chocolate mousse –a large portion was served and they left the serving bowl on the table so you could eat as much as you wanted. For the quality, it was very reasonably priced. 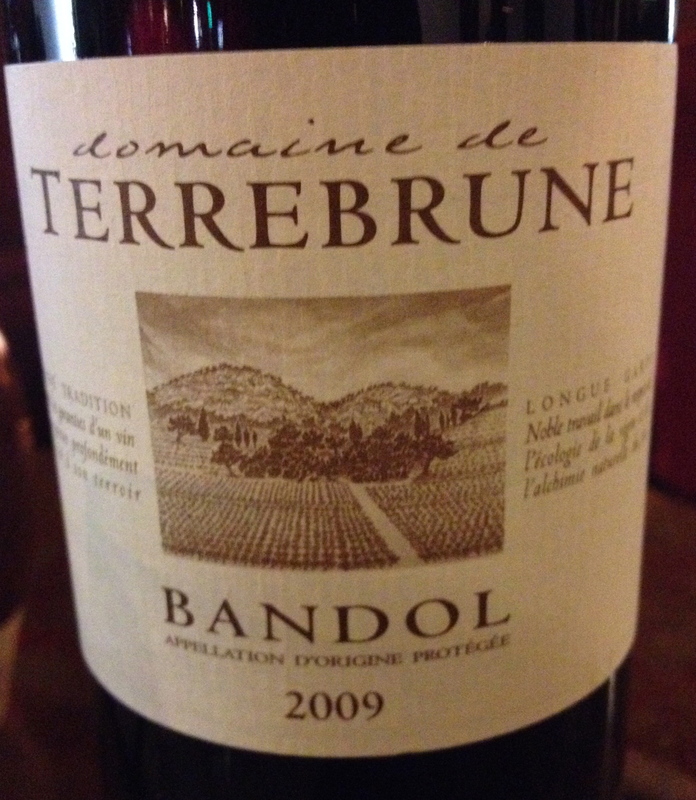 We drank a Bandol 2009 Domaine de Terrebrune made from 85% Mourvèdre 10% Grenache and 5% Cinsault . The average age of the vines is 25 years. The soil is characterized on the surface by limestone gravel in brown clay so characteristic that it inspired the name of the Domaine. There is total destemming and fermentation is for 15 to 20 days in a closed vessel, maceration is achieved by pumping over. The wine is aged in oak barrels 50 to 60 hectoliters for 18 months. The Domaine is certified organic. This is a wine that can age. The wine went very well with the food. Service was very pleasant and friendly. I enjoyed the whole experience and look forward to returning. 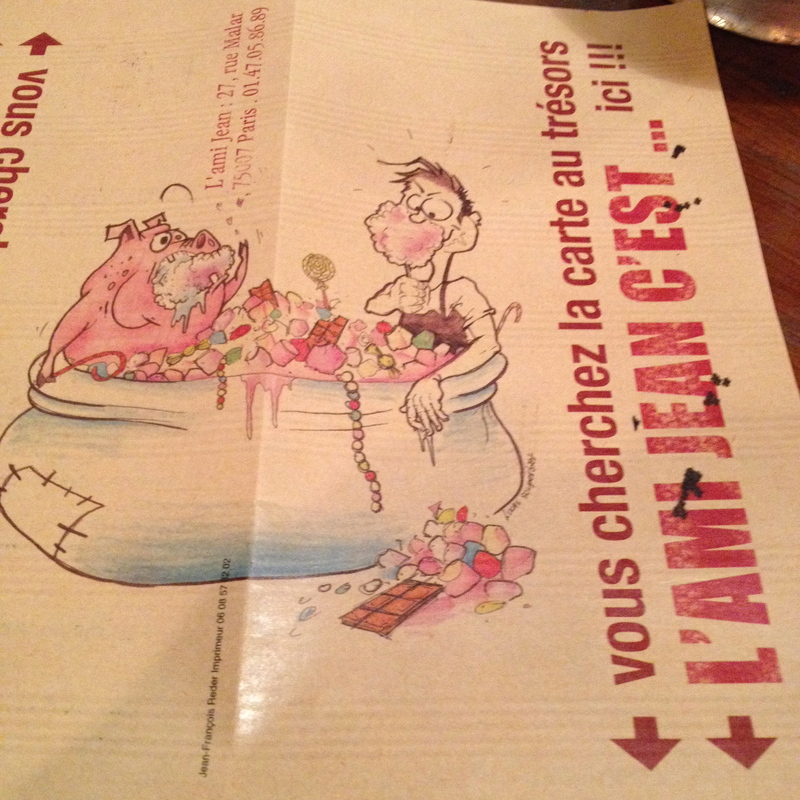 Michele wanted to try this place the last time we were in Paris but we could not get a reservation. It is a small crowded restaurant and you can watch the chef, Stèphane Jègo, preparing the dishes. He screams, he pleads, he shouts loud enough to make you jump, he is in his own world but what he produces is fantastic. We had the 5 course tasting chef’s choice menu. A fish dish was so good and so light that I wished there was more, a venison steak with a touch of caramel was without a doubt the best I had ever eaten, and for dessert, a rich rice pudding. It came with toasted walnuts and a salty caramel cream but it did not need any of it. I could not stop eating until it was all gone. 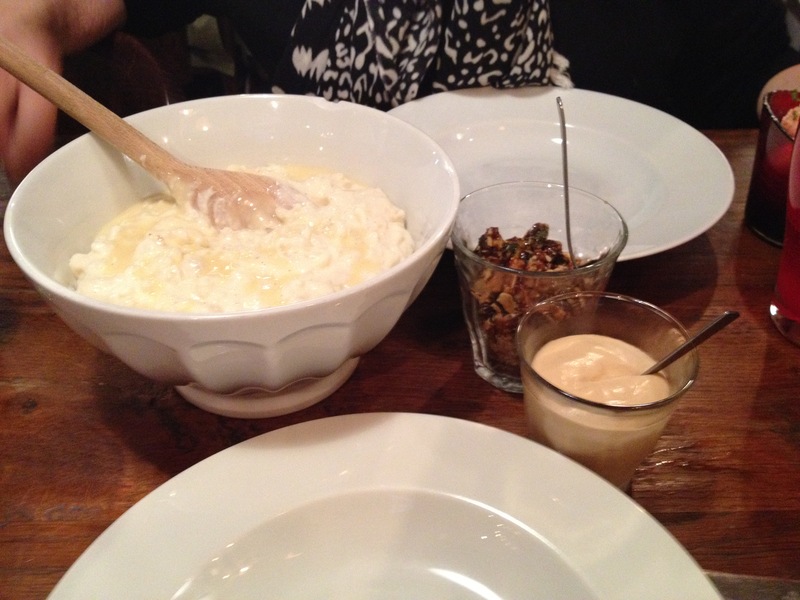 It was without doubt the best rice pudding I have ever had in a restaurant. Michele makes an excellent rice pudding. We drank another Bandol that day. Bandol 2006 Domaine Ray- Jean Made from 90% Mourvedre, 5% Cinsault and 5% Grenache. Each variety is vinified separately. The vines are old and not staked. Fermentation lasts for 20 days and malolactic fermentation takes place. The wine is aged for 2 years in 40hl barrels. It is a balanced wine with hints of blackberries and other fruits and spice with a nice aftertaste and long finish. This is a wine that can age for many years. Stepping into this small cozy restaurant one cannot help but notice shelves filled with wine. There is no wine list so if you want a bottle of wine you just take it off the shelves and bring it to your table. The wine is also for sale retail and if you drink the wine in the restaurant there is a 7 Euro charge above the retail price on the wine. 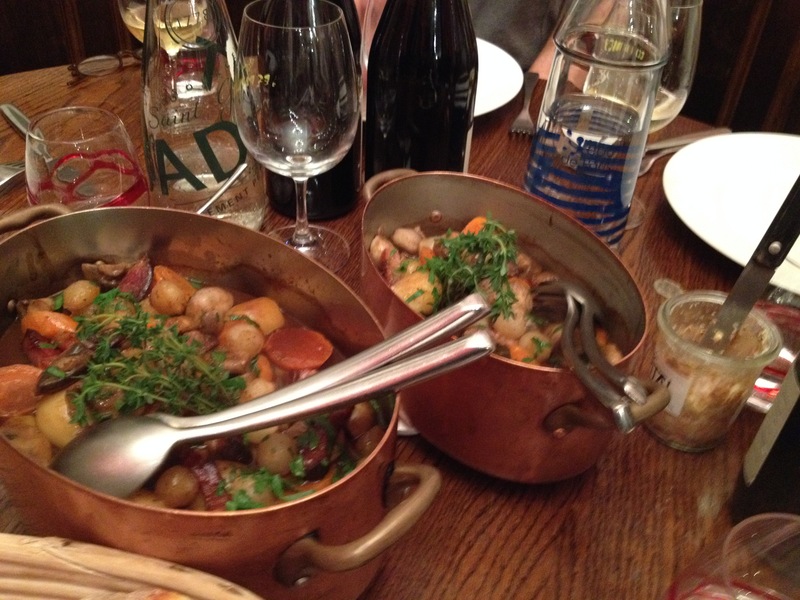 In the evening there is a four course menu set by the chef Ulric Claude (known as Tom). The menu changes everyday. There were six of us so we had the large table in the back of the restaurant, which was very comfortable. We made a number of trips to the shelves to pick wine for each course. We started with some delicious charcuterie and pate, followed by an excellent beef stew with mushrooms and potatoes, a cheese course and dessert. The food was very good and the stew alone was worth the trip. Our friends Nicole Serle and Travis Scott, owners of Turtledove wine store in NYC, chose the wines. They picked from the shelves wines that were rare and difficult to find in NYC. It was an excellent selection and all the wines went very well with the food. 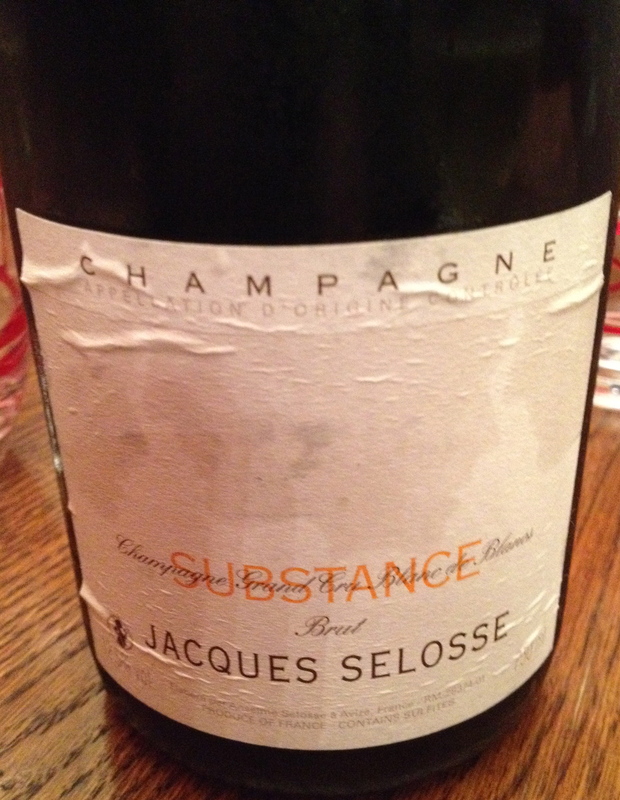 We started with Champagne “Substance” 100% Chardonnay Grand Cru Blanc de Blancs Jacques Selosse. Low yields; organic viniculture and terroir are a hallmark of Mr. Selosse’s wines. He has all Grand Cru holdings in Avize, Cramant and Oger. He uses indigenous yeasts for fermentation and ages the wine in barrels, 20% new oak. The wine is left on the fine lees for an extended period. Dosage is kept to an absolute minimum. “Substance” is a solar Champagne created by Mr. Selosse in 1986, by marrying some 20 vintages in order to avoid vintage variation and allowing the terroir to speak on its own. This is full-bodied Champagne with good fruit, hints of orange peel and spice with good minerality. 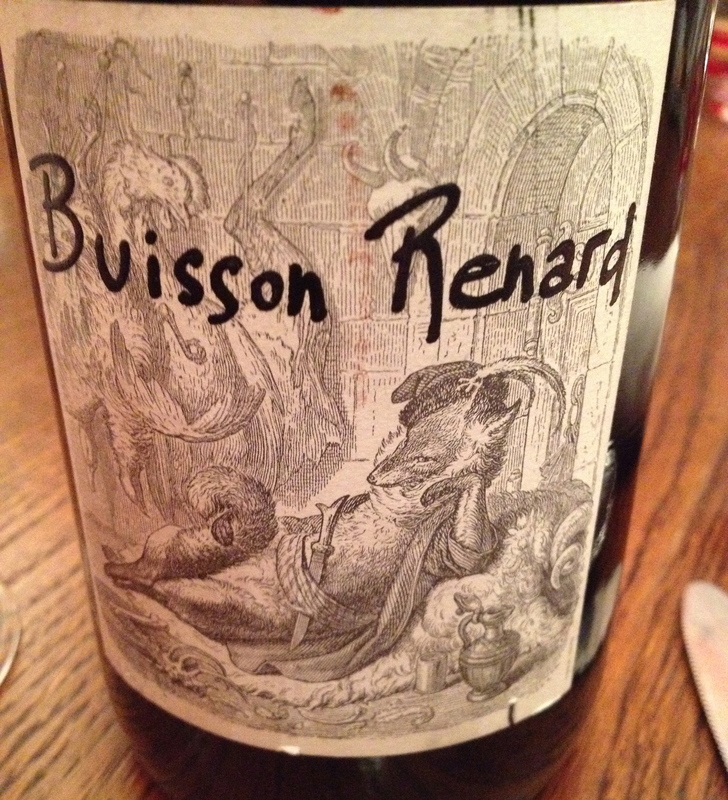 Bussion Renar 2004 D. Dagueneau made from 100% organically grown Sauvignon Blanc. The soil is clay and flint and the vineyard is mid-slope on the Southwest side of Saint Andelain, the highest village in the Pouilly Fume appellation. The wine is barrel fermented and aged in almost neutral 450 to 600 liter barrels. It is a very balanced wine with hints of grapefruit, lime, herbs, good acidity and a touch of flint. Clos Rougerad is an organic winery owned by the Foucault brothers. There are low yields, wild yeast is used and there is a long soft maceration with some new oak. The wines are vinified in barrel and bubble for a few years (18 to 24 months) depending on the vintage. The wine is stored in a glacially cold cellar and are bottled without filtration. Clos Rougeard “Breze” Saumur Blanc 2009 The wine is made from rare, old vines of Chenin Blanc from the Foucault’s own vineyards. The wine may be bottled as sec or demi-sec, depending on the vintage. The wine is golden-hued, with complex notes of dried fruits and nuts, a touch of honey and excellent acidity. The version we had was sec (dry). Clos Rougeard Poyeux Saumur-Champigny Rouge Saumur-Champigny is a red wine appellation of Saumur in the central Loire valley. 100% Cabernet Franc. Juice from 40-60 year-old vines is fermented in a mix of oak barrels. Half of the wine is fermented in new Allier barrels; the other half i in 1-year old barrels purchased from Ch. Margaux and Ch. Haut-Brion. 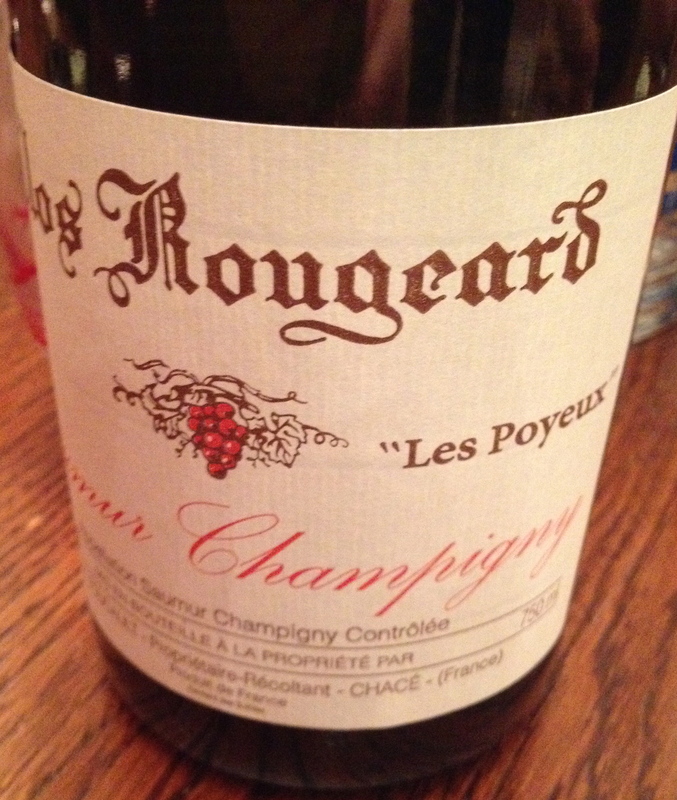 Poyeux’s bouquet displays hints of tobacco mingled with red fruit aromas. On the palate, red fruits flavors are rich and full. Tannins, though present, are remarkably integrated with a long finish returning with aromas of sweet, cherry tobacco. A very impressive wine. There are many wine stores in Paris but these are the two which I go to the most. Bossetti 34 Rue des Archives 01 48 04 07 77 www.Bossetti.fr They have a large selection Burgundy and Rhone Valley Wines and are famous for their Chartreuse collection. Look for older bottles from the Loire Valley going back to the 1950’s and not that expensive. If you are looking for old wine this is the place to go. Linonel Michelin, the owner, loves to talk about wine, especially older wines. When we were there he was doing a tasting for a group of young Japanese women and told us they were the leading wine bloggers in Japan. 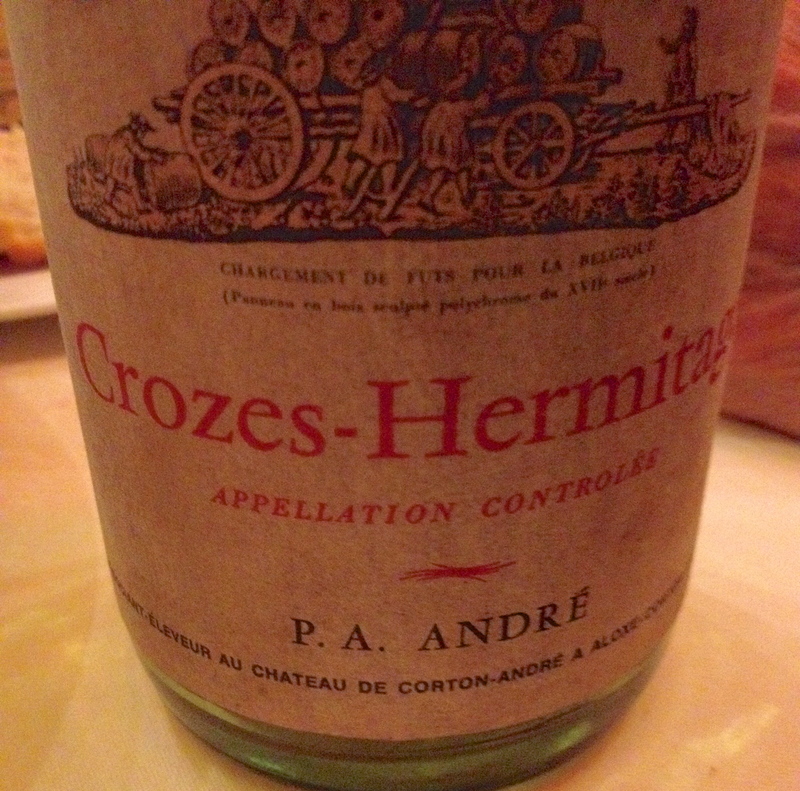 I purchased a 1964 Crozes Hermitage, Andre, which I drank and it was excellent. It was his last bottle. I also purchased a bottle of Hermitage “La Chapelle” Jaboulet 1980, 1983 Clos des Papes and a 1942 Bourgogne Patriarche. I opened the ‘83 and it was drinking like a young wine. The 1942 and the 1980 are resting at a friend’s house for a special wine dinner next week.